We are all familiar with the principle that leaders should emphasize the positive, build on strengths, and focus on abundance rather than deficits. We know that providing positive feedback is likely to produce higher productivity and higher engagement that criticism and negative evaluations. Ten years of research in the University of Michigan’s Center for Positive Organizational Scholarship has produced study after study confirming the importance of adopting a positive perspective and implementing positive practices in organizations, teams, and interpersonal relationships. Individuals, teams, and organizations do far better in a positive environment than in a negative, critical, or punishing environment. What happens, however, when we confront a real problem, a major mistake, or a situation where negative feedback seems essential? How can we possibly rely on positive feedback, capitalize on strengths, and focus on abundance when someone really goofs up? How would you react? What would you say? It’s natural to immediately focus on the low grade in math: “What in the world happened in math? How did you mess up in that class?” An alternative, however, is not to abandon positive communication and a focus on strengths but to maintain consistency in utilizing them. My friend, Jim Mallozzi, the former CEO of one of the Prudential Financial Services companies, found himself in a situation with his daughter just like the one described above. Jim is completely dedicated to positive practices in his company, and he wanted to apply it at home as well. His daughter, Mary, came home with good grades across the board except in math class where her grade was abysmal. Here is the way he approached the situation. Guess what Mary’s grade was at the end of the next semester in math? A. The point being illustrated is that regardless of the problem or situation, capitalizing on the positive, finding a way to build on strengths, and reinforcing an abundance mentality almost always produces better results than focusing on mistakes, harping on weaknesses, and reinforcing a deficit mentality. Great everyday leaders help others flourish and improve by building on the positive. 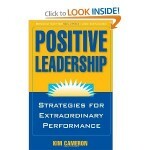 Kim S. Cameron is the Associate Dean of Executive Education in the University of Michigan’s Ross School of Business. His past research on organizational downsizing, organizational effectiveness, corporate quality culture and the development of leadership excellence has been published in more than 120 academic articles and 14 scholarly books. His current research focuses on virtuousness in and of organizations–such as forgiveness, gratitude, kindness, and compassion–and their relationship to performance. 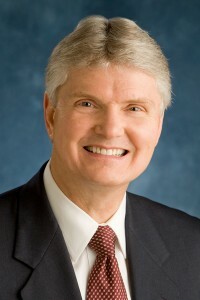 He is one of the co-founders of the Center for Positive Organizational Scholarship at the University of Michigan.